When making homemade compost mixes only mature i.e. fully decomposed compost should be used and this should be sieved (screened) so that it consists of small particles of a relatively consistent size. 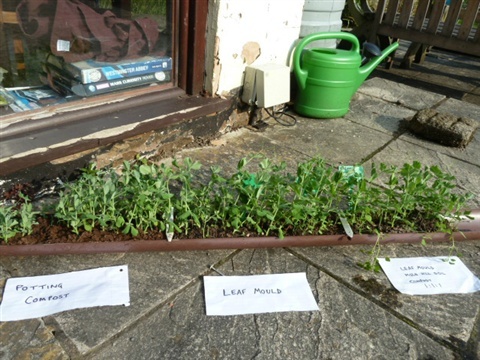 The cheapest shop option for small quantities is a Seedling Potting Riddle this has a 4mm galvanised mesh sieveto provide a compost for planting seed. A hand operated Rotary Soil Sievis a more expensive option which will create a compost, suitable for for Seed and Potting compost. Dry compost from the bin on the seive and the handle is rotated pushing the material through the 2.5cm/1" x 1.5cm/0.5" mesh. 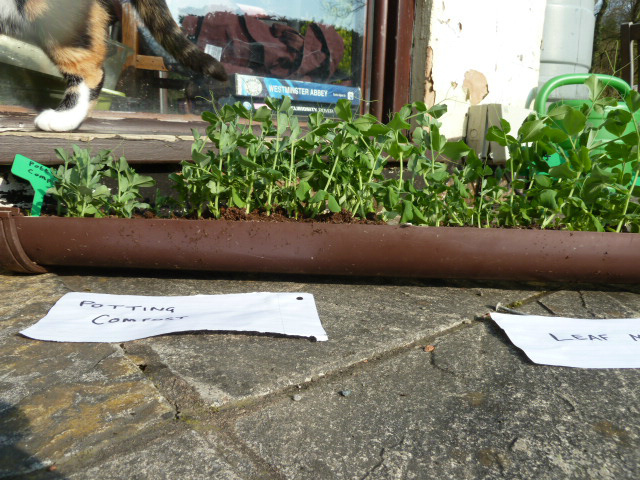 Both of the above can be purchased from http://www.harrodhorticultural.com and other suppliers. While sieves, such as the above, can be purchased it is relatively easy to make a wooden a box frame of a size to fit onto your wheelbarrow. A strong weld mesh base with 6mm holes should be fitted securely to the frame. Remember it will be used quite roughly so make sure that the frame and base are well secured. 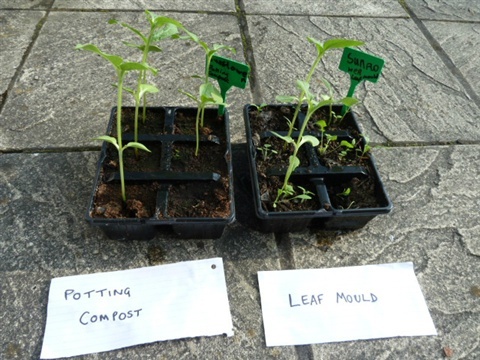 Making homemade seed or potting compost using garden compost direct from the bin or wormery for germinating seeds, potting on young seedlings and rooting plants from stem cuttings risks the introduction of weed seeds, pathogens or organisms that may damage tender plants . 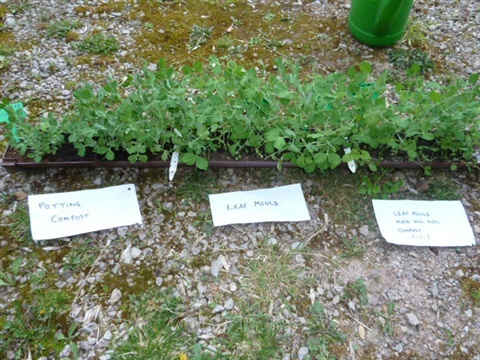 The same risks exist if untreated soil is used as part of the compost mix. It is not necessary to heat treat the garden compost or soil mixtures used for potting on those plants that are almost ready to be transplanted into the garden. Sterilising the compost or soil in Pyrex dish or metal roasting tray (covered by foil) in a preheated oven at 160C for an hour is an effective means of sterilising the compost. The dish or tray should be filled to a depth of not more than four inches so that the compost in the centre reaches the required temperature. The tray of sterilised compost should be remove from oven and allowed to cool before use. Sterilisation is an effective way of eliminating the risk but it means that everything is killed is including beneficial organisms. Heating the garden compost, or soil, at a lower temperature with remove pathogens without damaging nutrients . Motherearth (www.motherearthnews.com/homesteading-and-livestock) suggest a method for the pasteurization of compost so as to destroy harmful organisms but not the beneficial ones. Compost is placed in an aluminium baking pan (I prefer a Pyrex baking tray) again to a depth of 4 inches. A meat thermometer is placed in the compost at centre of the tray, so that it can be read while the tray is in the oven. Pre-heat the oven to 93C ( 200F) and insert the tray. Bake for 30 minutes once the thermometer records a temperature of 71C (160F). Cool the compost before use. Gardening Know How (www.gardeningknowhow.com) suggest a method of sterilising compost or soil using a microwave. About a kilogram of compost is heated in a microwavable container covered by Clingfilm with added ventilation holes. The compost is heated for about 90 seconds per every kilogram (approx 2 pounds) on full power. Alternatively a kilogram of moist soil can be microwaved in an open polypropylene bag for 2 to 2 .5 minutes on full power (650 watt oven). The bag is closed and allowed to cool before removing. A problem common to all methods involving invading the kitchen is that the sterilisation or pasteurisation will give rise to an earthy smell that may not be popular with everyone in the household. An alternative could be used a propane gas Outdoor Camp Oven. 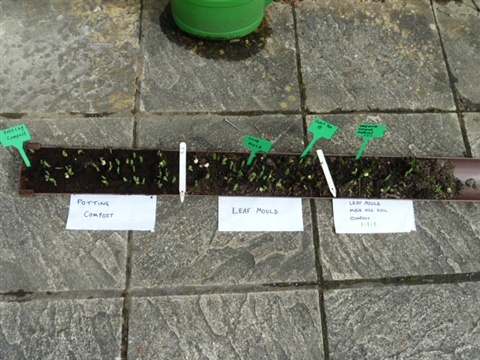 Seeds contain stored nutrients and will need few additional nutrients to germinate and start to grow , so compost straight from the bin or wormery will be too rich to be used as a seed compost. It will also be of the wrong texture and may not provide adequate drainage. While Leafmould has a low nutrient level and could be used as initial seed compost the seedlings would need to be pricked out and transplanted almost immediately after they have germinated to provide sufficient nutrients for future growth. It is therefore better to make a seed compost containing just sufficient nutrients to provide for germination and initial growth. 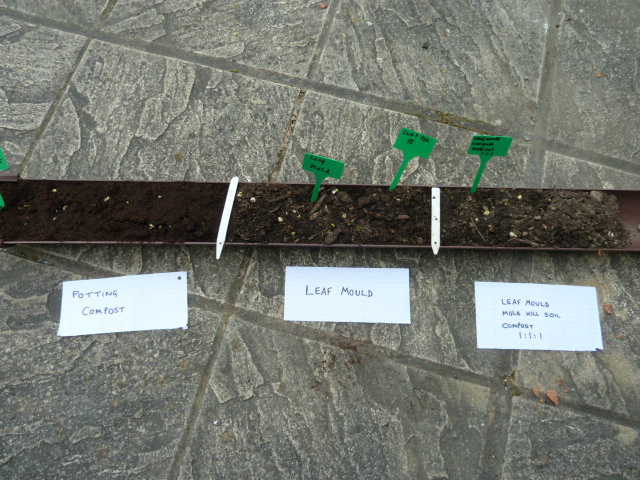 Then, as the seedlings grow, and need more nutrients transplant them into larger pot containing a potting compost with a richer mix of nutrients. 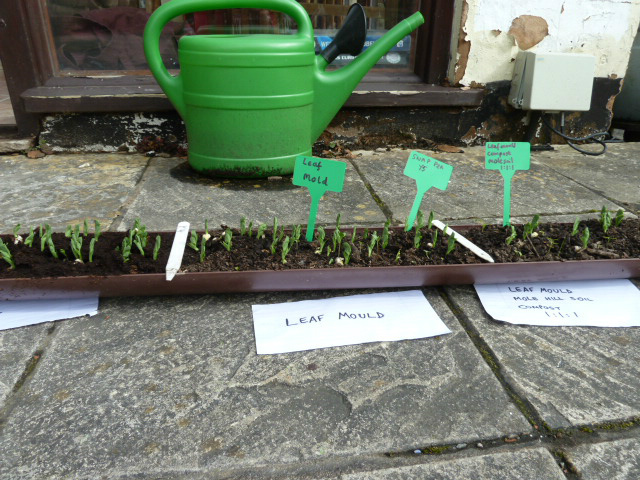 Potting onto larger pots, may be required several times, increasing the size of the pot gradually, when the roots nearly fill the existing pot. In addition to providing nutrients the compost should provide drainage, so that the soil does not become waterlogged and cause the seedling to rot, while retaining sufficient moisture for the plant to grow. 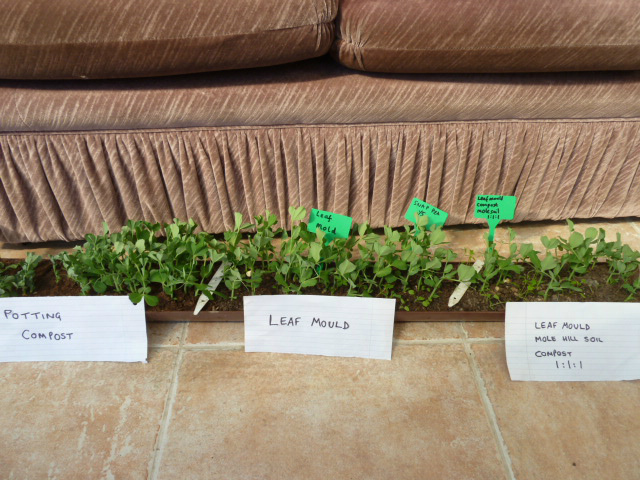 It will need to contain air spaces so that soil microbes and the roots will have oxygen while being of an even consistency free from lumps. This favours a light or fine textured mix but it must be sufficiently firm to retain and support the seedling as it grows to a size suitable for potting on. It should also retain its volume in the pot and be free from pest and disease. 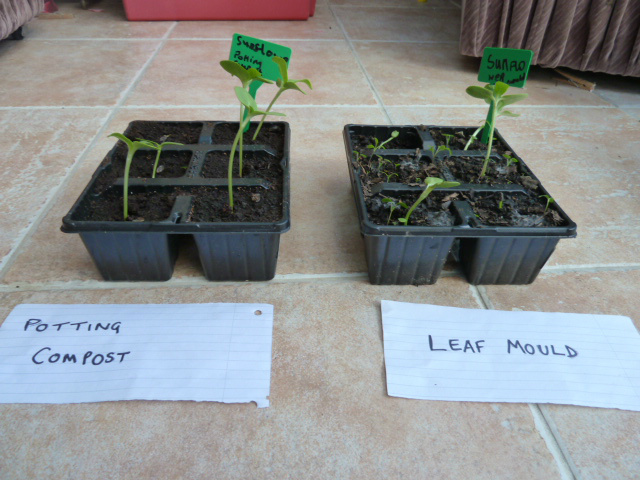 Leaf mould, two years old. 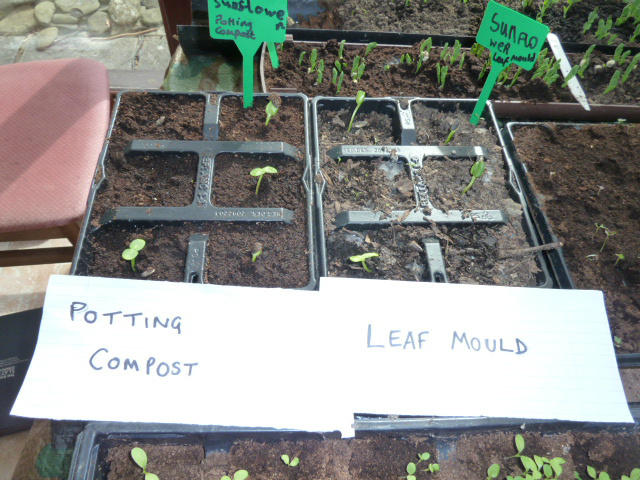 One part sieved leaf mould or garden compost. One part leaf mould, composted bark, or coir. One part sharp sand or vermiculite. One part sand or grit. A variant of this mix can be used as a potting mix when the young seedlings when ready to transplant (see below). When the seedling has rooted it will need to the transplanted to a mix containing more nutrients to support growth until it is of a size suitable for planting out. 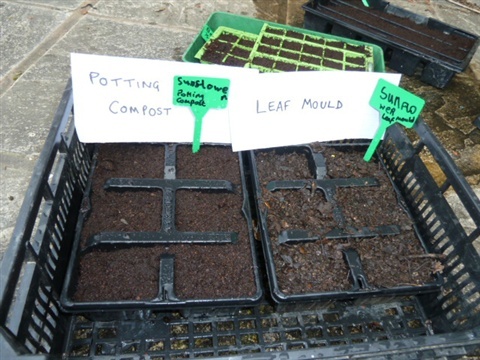 Additiona ingredients, such as sharp sand or vermiculite can be added be added to the potting mix to produce a freer draining compost. These free draining composts can also be used for cuttings. Heavier than modern peat mixes, but still has good drainage. 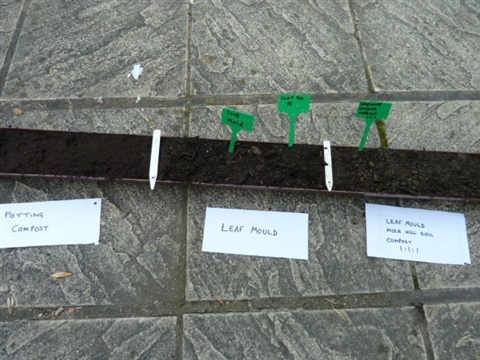 A suitable compost for cuttings will must provide good drainage so that the cuttings do not rot as well as sufficient nutrients to support growth. One part loam (sieved but not pasteurised). 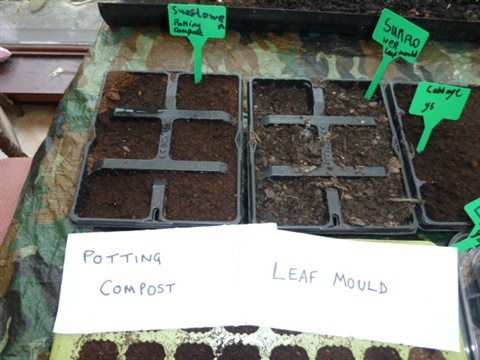 One part garden compost, leafmould or composted bark. 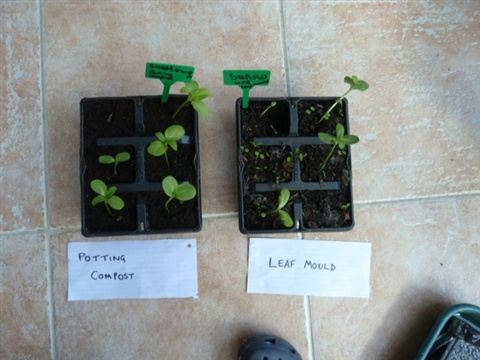 When permanently growing plants in pots or containers a more nutrient rich mix will be required. It is necessary to provide sufficient nutrients to feed the plant during both its growth and flowering and/or fruiting when growing plants such as tomatoes and peppers. I addition to the compost I would suggest using a liquid feed when they a fruiting. worm compost can also be used to provid an additional nutrient boost. 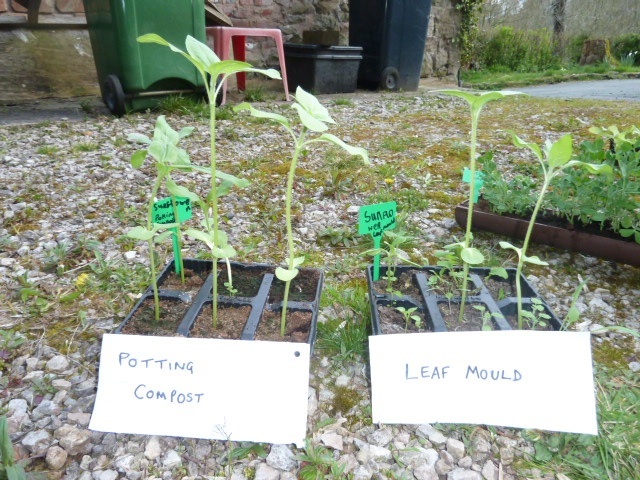 The following photos showing a comparison of leafmould and compost are taken at Whittington Primary School in Shropshire.